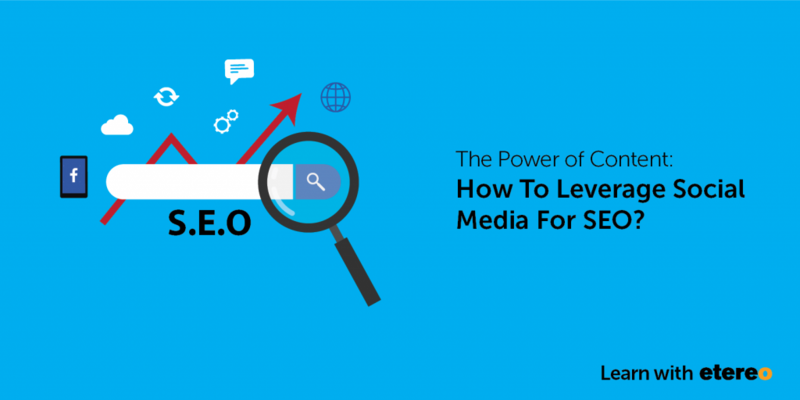 The Power of Content: How To Leverage Social Media For SEO? This article is contributed by our sister company, Etereo. Etereo is a creative digital marketing agency helping SMEs to build their digital capabilities and presence through research and value-driven strategies. Visit Etereo. As a Brand, it is pertinent to continuously optimise web traffic and conversions organically through content marketing, and the two key strategies that are effective and are frequently used are Search Engine Optimisation (SEO) and Social Media. You may think by hopping on the bandwagon of Facebook, Twitter, Instagram, LinkedIn or any social media platform is sufficient. If you are not leveraging on social media effectively for SEO then you may, in fact, be wasting your time and missing out on the opportunities. While using social media to connect with your audience, you need to also optimise social media with SEO tactics and strategies. Social media relies on high-quality content and a visible, strong Brand presence, the efforts you spend on SEO can exponentially increase your social media reach and greatly boost search engine results with your Brand profile and content showing up on search engines like Google. Social media and SEO are two tightly-interwoven strategies, but what kind of impact does social media have on SEO, and how much of an impact are we talking about? How do you align social media with SEO to get the best results? 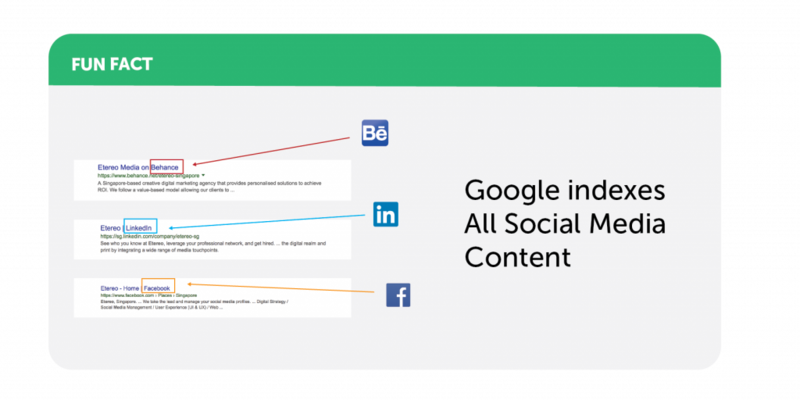 Every piece of content that you create on your social media posts and tweets, is treated like any other web pages by Google index. 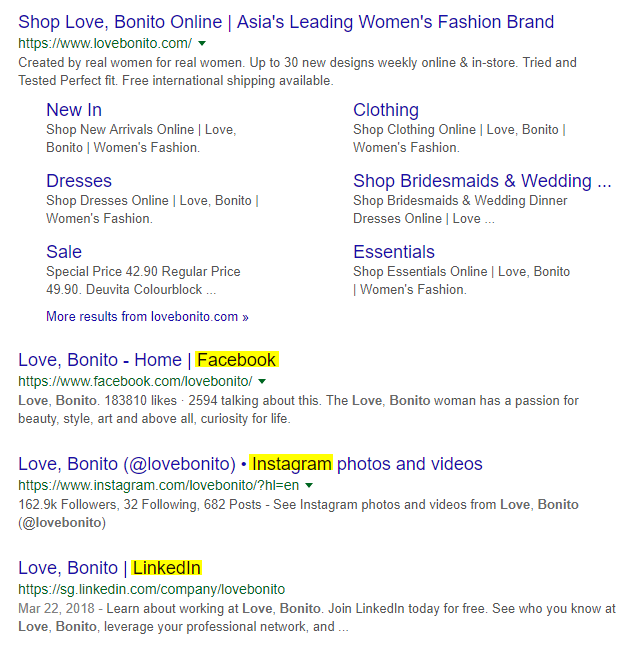 Yes, Google indexes all social media content. It’s easy just to share the right content on your social media channels for SEO and Google will be able to index that content along with its user-generated content to rank top in search results. Your social media accounts do influence search engine results. In fact, your social media profiles are often among the top results in search results usually right below your own website. Your social media profiles matter to Google and particularly users searching for your Brand online. Google helps users navigate not only your website easily but also all social media channels pertaining to your Brand where users can simply check out your updated social media content and start engaging with you. As a matter of fact, social media platforms are heavily dependent on their own search functions which perform searches on real-time queries which include content keywords and profile or Brand names. 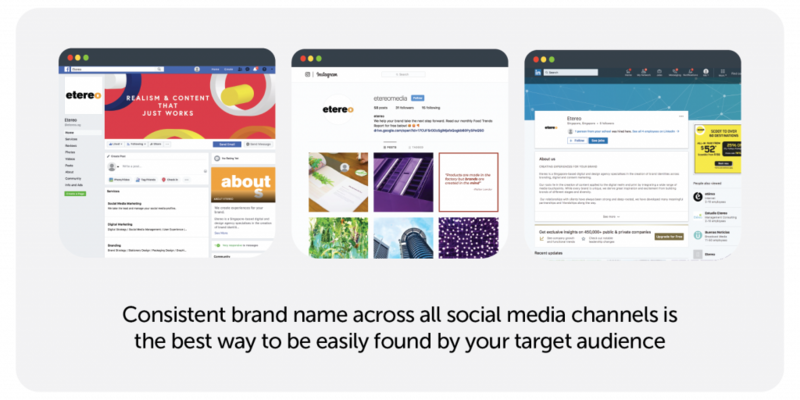 Depending on the user, one can easily search for your Brand on the social media they use most frequently. The more users who find you on social media, the more they will end up visiting your website. If users like your Brand personality and the content you share on the social media, they will visit your website more often. This will eventually generate increased traffic to your website, which is the fundamental requirement for improved search engine rankings. Make sure your social media accounts stay active by posting regularly so that you will get searched more often and increase the awareness of your Brand organically. And if users share your content, there’s a high chance that they will link to it and it’s one of the most important SEO factors. The influence that you have on the social media defines your Brand authority. The more likes, shares, and followers that you have on social media, the more people will click through to your website, improving search engine rankings. Since social media is highly personalised unlike websites, most users will prefer visiting your social media profile before they visit your website to get a better sense of your Brand’s personality. Growing number of followers is a slow process, but so long as you’re consistently presenting your Brand uniquely on a regular basis to real and engaged users, it is effective and worthwhile. The more fans, followers, likes and shares your Brand receives on social media, the higher ranking you will go on search engines when users search for your Brand. By focusing your efforts on social media marketing, you are more likely to attract the right kind of audience and followers. Social sharing tools should be integrated on your website for easy sharing. Include links to your social media channels from your website and from your social profiles back to your website. Leveraging on SEO will tremendously increase your Brand’s search visibility and traffic to your social media channels and website, thus promoting your content with ease while achieving SEO’s end objective of driving exponential traffic to your website organically. As always, we are happy to hear from you. We understand that you may be consumed with daily operations and pressing issues requiring your expansive attention, as such, with the current social media you are equipped with, may not be fully optimised. You want to tap on SEO but is unsure on how to build meaningful content or a strong Brand personality, talk to us. Etereo is a content, branding and digital marketing agency with strong and effective technical expertise to build SEO for your social media and website. We help clients to audit and analyse their social media and sites, and we are happy to talk to you regarding your free SEO analysis with us.